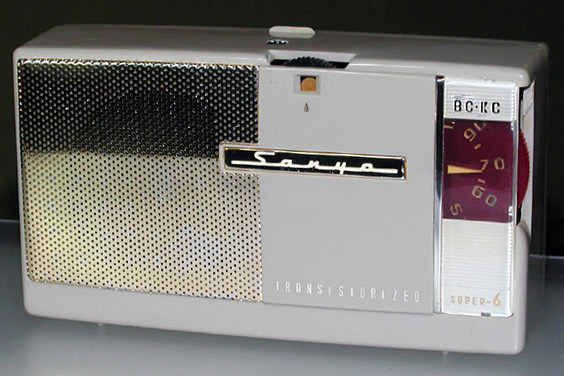 This horizontal set was the second transistor radio built by Sanyo. To me it speaks of elegance, maturity, and dedication to making a great product. Following just shortly after the 6C-1, Sanyo's first transistor radio, the 6C-3 went on sale around July of 1957. The release dates were actually close enough that the new product announcement for both models appeared in the same editions of the leading Japanese monthly radio & electronics magazines. The retail price in Japan was ¥13,900. The unit you see above is one I picked up locally in Japan. This one has an off-white face, grey back cover, purple speaker grille that appears to be anodized aluminum, and uses purple lettering for the "TRANSISTORIZED" logo on the face. I list these details in contrast to the coloring of the unit below that made its way back to the country of its origin from Canada. The white-with-gold section above and below that slick maroon tuning dial is reverse painted. The speaker grille and metal Sanyo logo are plated in a subdued (champagne?) gold colour. The all-grey cabinet is made of a hard plastic one might liken to plaskon. And, trivial but fun, the volume switch shows a gold circle when the radio is off, but that changes to a red stripe that grows broader as the volume grows louder. While I haven't intentionally hidden anything, the unit shown here has seen better days. It had been cleaned up some before it reached my hands, but the radio looked as though it had gone down with a boat on the ocean and was recovered years later. It cleaned up well enough, but there are a couple of chips as well as a few nice cracks. Actually, the unit at the top of the page also required a good once-over when I bought it. Maybe later I'll post photos of what it looked like prior to restoration. Update Note (08.01.27): I added a page showing the leather carrying case for the 6C-3.